Shanghai Shenhua finally kick-off their first home game of the Chinese Super League 2010 season on Saturday against local rivals Hangzhou Lvcheng after being on the road for the first two games of the year. And probably for the first time since a professional football started in China in 1994, Shenhua are not among the title favorites. The forthcoming football season in China is all about good news and bad news. The bad news: Chinese football again found itself up to its neck in a corruption scandal during the close season. The scandal saw two teams relegated to the second tier league (Guangzhou and Chengdu Blades), a second tier league team (Qingdao Hailifeng) dissolved, and a host of officials and bureaucrats from the world of Chinese football hauled in for questioning, including the former head of the CFA, Nan Yong. He now finds himself in jail after admitting taking bribes and other ill-gotten gains, including gold, diamonds and luxury watches. The good news is that, Chinese football has seen it all before and has continued to stumble on happily enough. Plus the average crowds on the opening day of the season two weeks ago were around 21,000 according to Sina. That’s a healthy figure, beaten only by the German, English and Spanish leagues and around the same as Italy’s Seria A. Tellingly, sponsors Nike and Pirelli are continuing their respective deals and paying a combined $22 million to the Chinese Super League each year. And perhaps most surprisingly of all, for the first time in over 30 years, China managed to beat South Korea in the East Asian championships during the close season. A full analysis of the corruption problem is worthy of a whole book in itself. Suffice to say it seems to be concentrated in the second tier amongst teams bidding to get promoted into the Chinese Super League. Guangzhou and Chengdu Blades were both relegated for this reason, having been found guilty of match-fixing whilst in the second tier in 2006 and 2007. The infamous black whistle scandal of 2001 saw several 2nd tier teams heavily punished for similar match-fixing transgressions. Replacing Nan Yong in January was Wei Di, the new head of the Chinese FA. However any hopes of a fresh perspective on things were dashed with his bizarre suggestion to put an under-21 team in the Chinese Super League consisting of China’s most promising youngsters so that they might train together from an early age and develop into international stars of the future. The Soviet-style idea was ridiculed in the Chinese sporting press and quite rightly so. 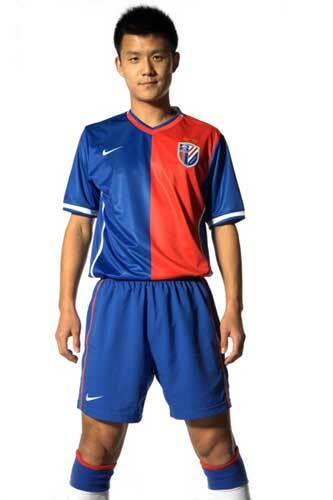 For Shenhua however, the prospects for this season do not look overly bright. The Hongkou Stadium club have had something of a clear out, selling a host of long-serving established first team players, such as national team defender Du Wei and promising striker Gao Lin. There is also a lot of discontent that there are no longer any Shanghainese players in the side, now that Mao Jianqing left to join Shaanxi. Local forum KDS has several posts denouncing owner Zhu Jun and saying Shenhua are now a “hard disk team” – a reference to the mandarin word for outsider, waidiren, check the full explanation here. That fans want to see local lads in the colours is understandable and a good sign. Also exiting through Shenhua’s rapidly-spinning revolving door are all of last year’s foreign players, including Vyacheslav Hleb (to Shenzhen) and Mark Milligan (to JEF United Chiba in Japan’s J-2 League.) In contrast to most of the foreigners Shenhua signed in recent years, both of those players were of a higher level of ability than most of the local players and had a positive impact on the team. It remains to be seen whether this year’s foreign crop, Brazilians Vicente (striker), Aldorado (defender), Syrian defender Ali Diab, Cameroonian striker Jean Michel N’Lend, and Columbian forward Duvier Riascos, will have the same impact. Shenhua are most likely to finish upper-mid table. Despite losing the Chinese core of their team, some fans believe that Shenhua, who haven’t won the championship for seven years now, had nothing to lose with their clear-out of their star Chinese names. This is despite the fact they have not signed any well-known Chinese players to replace them. Also new this year is Croatian coach Miroslav Blažević. He took unfancied Bosnia to within a whisker of their first World Cup appearance, and were unlucky to draw Portugal in the European play-offs, after FIFA fixed the draw to make it easy for the big teams to get through. Blažević is something of a character and has stated that he believes he can bring glory to Shenhua’s long-suffering fans, who have watched their team finish runners-up eight times since pro football began in 1994. He is no spring chicken though – at 75 years old, he’s one of the oldest managers in world football and has been in football management since 1968. His vast experience should ensure that the unorthodox goings-on which are a regular feature in the colourful world of Chinese football will be nothing new to him and not have a detrimental effect on his health. Finally, as if the Shenhua fan’s haven’t suffered enough in recent years, the omni-present Expo claimed another victim in the shape of Shenhua’s home jersey. This season the team will forgo that most basic tennent of football culture and change its team colours by running out in a hideous half red-half blue design. In such a fashion-conscious city as Shanghai, this strikes your correspondent as something of a faux pas. Owner Zhu Jun claims the red half represents the Chinese pavillion and is to show support for the Expo. It’s a move which he has quite rightly taken pelters for – word on the terraces is that the Ultra groups will mostly be wearing last year’s jerseys. They aren’t called the Blue Boys and the Blue Devils for nothing….